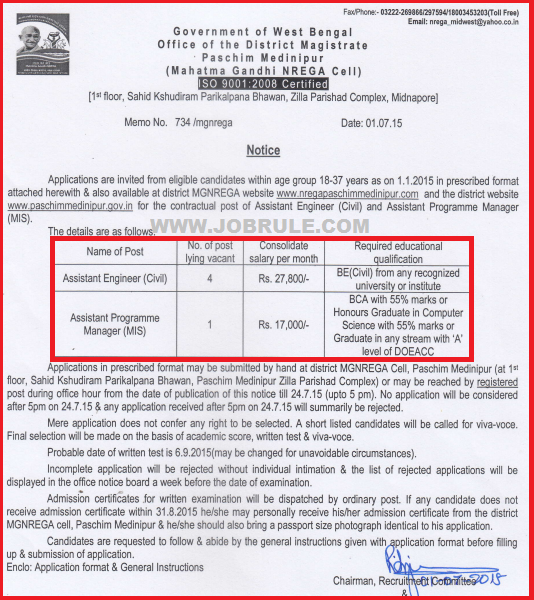 Office of the District Magistrate, Pascim Medinipur District West Bengal (Mahatma Gandhi National Rural Employment Garuntee Act-MGNREGA Cell), invites application in prescribed application form for recruitment to the post of ‘Assistant Engineer (Civil)’ and ‘Assistant Programme Manager (MIS)’ on contract basis with consolidated per month salary. Pachim Mednipur District MGNREGA Cell latest Assistant Engineer (Civil) & Assistant programme Manager (MIS) Job Advertisement & Application Format. Contract Basis Job Opening in Medinipur .